This section publishes a wide range of accessories incorporated with symbolic meanings of feng shui. 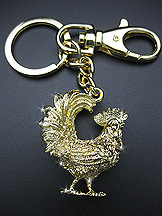 This handsome looking golden rooster amulet has a solid crown on its head, a well shaped beak and a masculine tail. Its firm, confident and fierce gestures enables it to counter office politics, business competitors and 3rd parties in your relationship. The rooster is also believed to be able to boost your fame luck and authority for the patriach. For those who are facing troubles at work, carry along this rooster to work to ward off scheming people and troubles in the workplace. For housewives, this rooster will help you keep the family away from 3rd party affairs and provide you with authority luck at home. The golden rooster made from metal represents the intrinsic metal element of the Rooster in the west. It is especially recommended to activate the Tao Hua Love Luck for those born under zodiacs rat, dragon and monkey according to the lunar calendar. Therefore the rat, dragon and monkey will benefit optimally from carrying a rooster with them at all times. Additionally, the rooster is also the secret friend of the dragon. Therefore, the dragon will need the help of the rooster to boost their luck when they are facing the bad times. Camel is known for its resilience and persistence. The camel is often used in feng shui for those who are carrying out an important undertaking and needs good luck to ensure that the undertaking will not fail. It is also the main ingredient to remedy for those who are facing a tough time at work, experiencing financial problems or have personal problems in personal life. It will bring you out of troubled times so that you will be unharmed and blessed with good luck. The camel is best to bring out someone's talents so that he will not be left unnoticed, and at the same time overcoming difficulties and nourishing him with good luck. The keyholder is made from brass, plated gold and bejewelled to high esthetic appearance. 1. Gift of love for the one you admire. 2. Gift of good fortune for your loved ones and close friends. 3. Enhancer of unending good fortune for those seeking for wealth, love, health and career. This key holder is best cuffed onto your beautiful handbags. This is a super gorgeous modern looking mobile hanger with the mystic knot. The mystic knot is considered as the most influential symbol in Period 8. Those using this powerful mystic knot symbol will have the influence of the number 8 multiplied, thus enjoy extra good fortune. Mystic knot is also equivalent to the infinity sign done endless times. It is specially strung with the precious Citrine and Peridot gemstones to magnify its potency. String this hanger onto your mobile to usher in good news from your mobile. In general the mystic knot will multiply your health luck, wealth luck, relationship luck and extremely good fortune in all areas of your life in the Period 8.